The Cedar Lake collection is solidly handcrafted from carefully selected and hand-peeled Northern White Cedar Logs. The peeling process leaves some inner bark or cambium on the logs, accentuating the natural character and beauty. The naturally aged cedar logs used are rich in character from nature herself and may feature beetle marks, burls, gnarls, and other natural, rustic characteristics. The logs are tenoned to enforce rigid construction. Add a bit more style or contribute to the theme of your room or cabin with our Silhouette Log Dining Chair. The Cedar Lake Silhouette Arm Chair has a wooden contoured seat designed to be comfortable for hours on end. Choice of finish or leave unfinished. Six rustic silhouette cutouts to choose from. 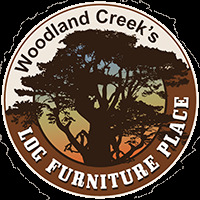 Free shipping on orders of 6 or more chairs and/or chair orders purchased with a larger Cedar Lake freight item (dining table, pub table, desk, bar, buffet, etc.). If your order does not fall under this umbrella, we will contact you with a shipping quote.